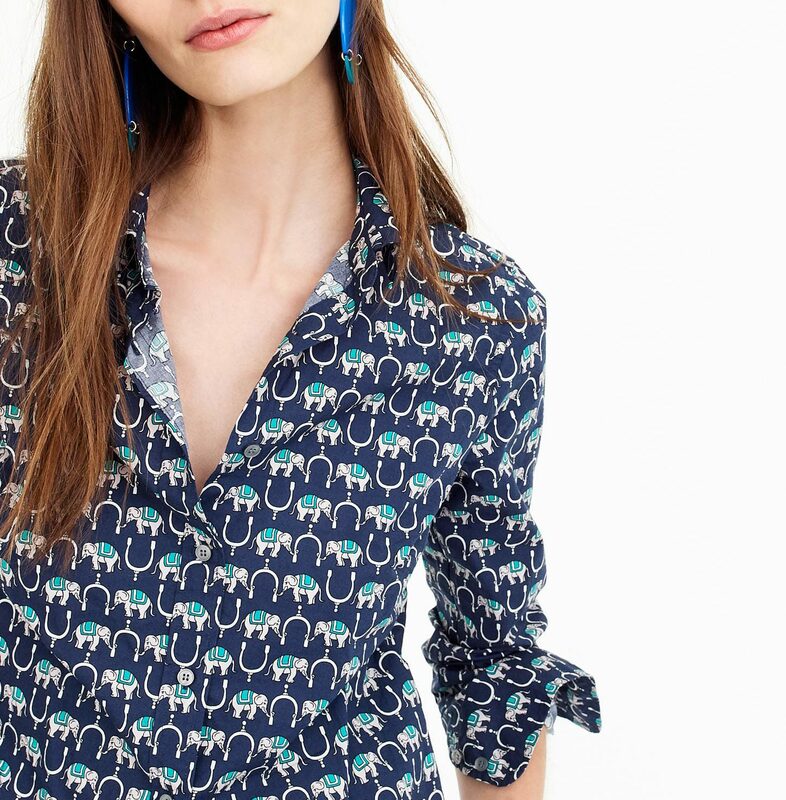 Tops with really good prints are a nice shortcut to having a “look,” and I am all about style shortcuts this time of year. 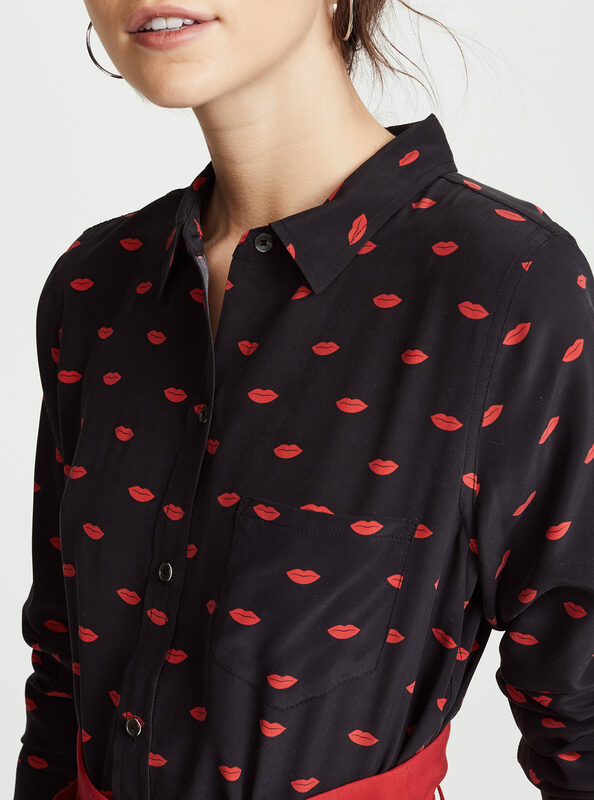 I think this lip print is both chic and cheeky. 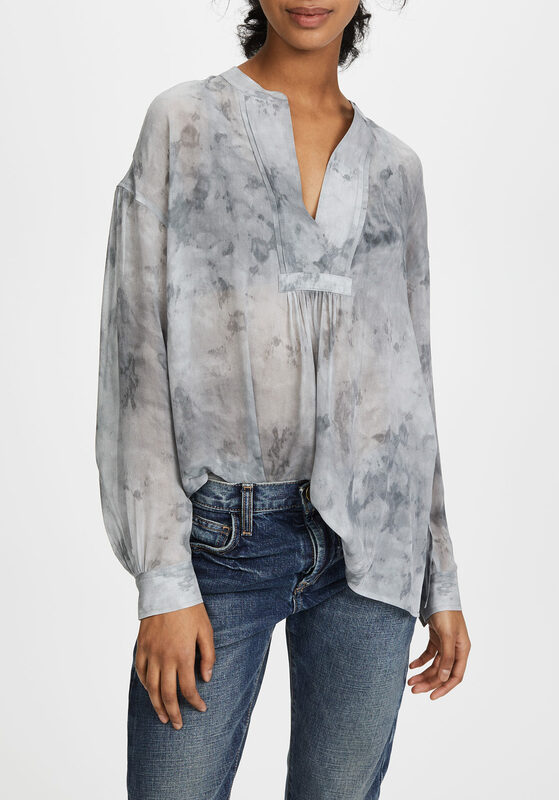 I ordered this Etoile Isabel Marant top over the weekend, and it came yesterday and is so good that I put it on immediately (with a cami; it’s pretty sheer). The print is unstoppably cool, and is also blue and black, which is maybe my favorite color combination. I like the idea of dots on a red background. It’s so nice and bold. 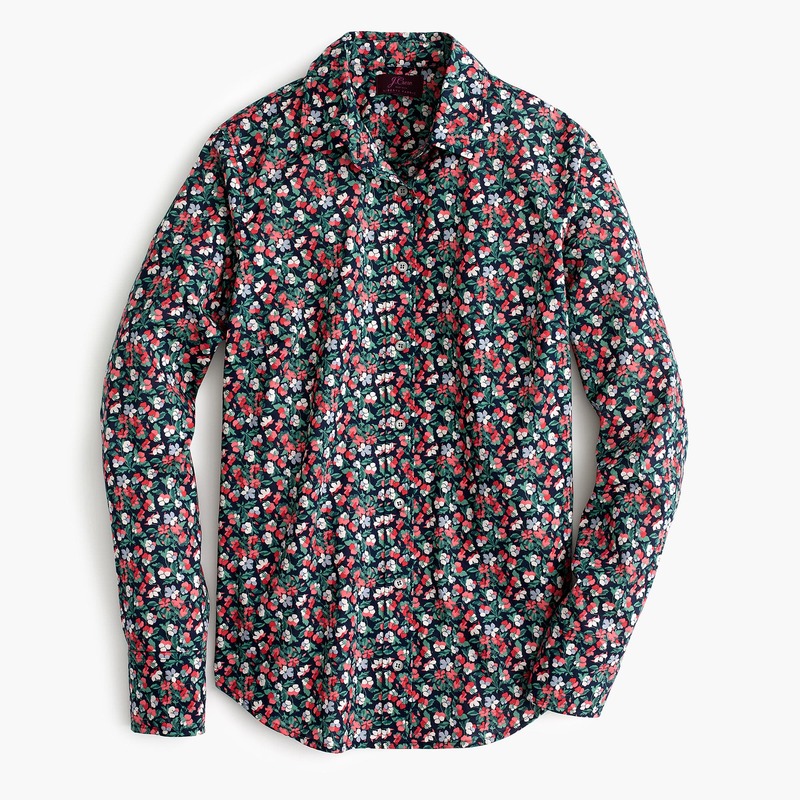 Just a very cheery Liberty of London option. Something about the fact that the dots on this tie-neck top are outlined in black makes the whole enterprise more sophisticated. 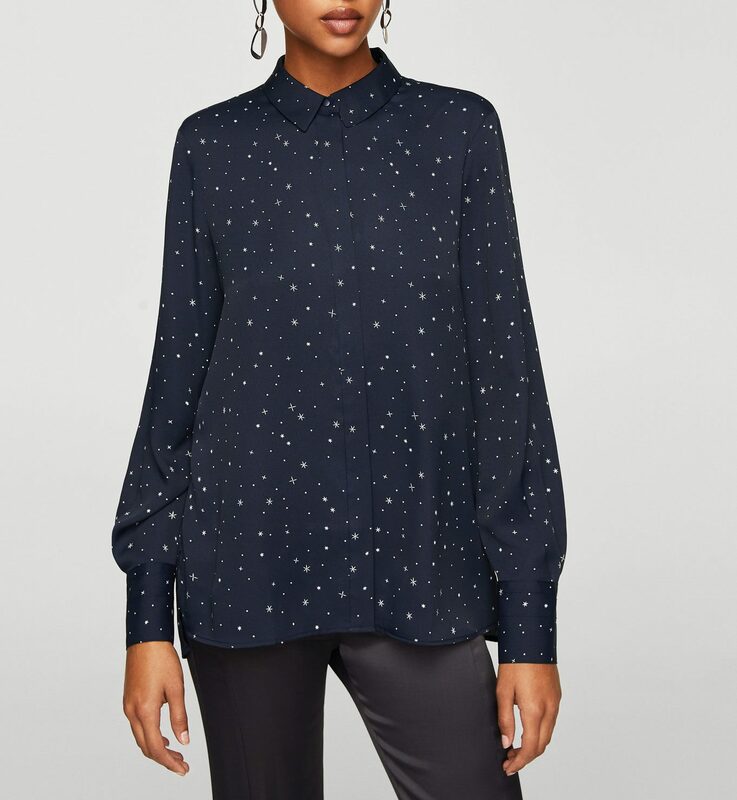 This popover looks so comfortable and slouchy, and the print is nicely moody, if that’s a thing. I enjoy the pops of pink here. A very feminine choice, and a very good red, which I’m always partial to. 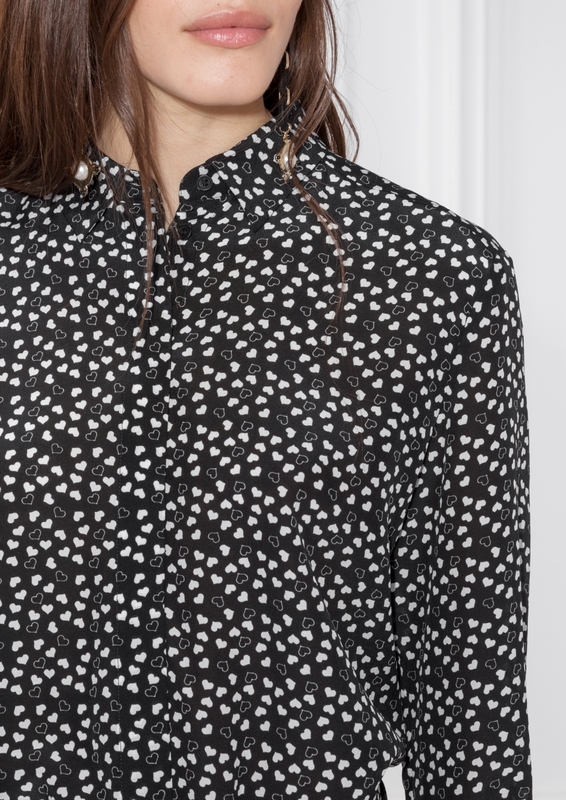 Click through and magnify the image, and you’ll see that this button-down has the cutest starburst pattern. 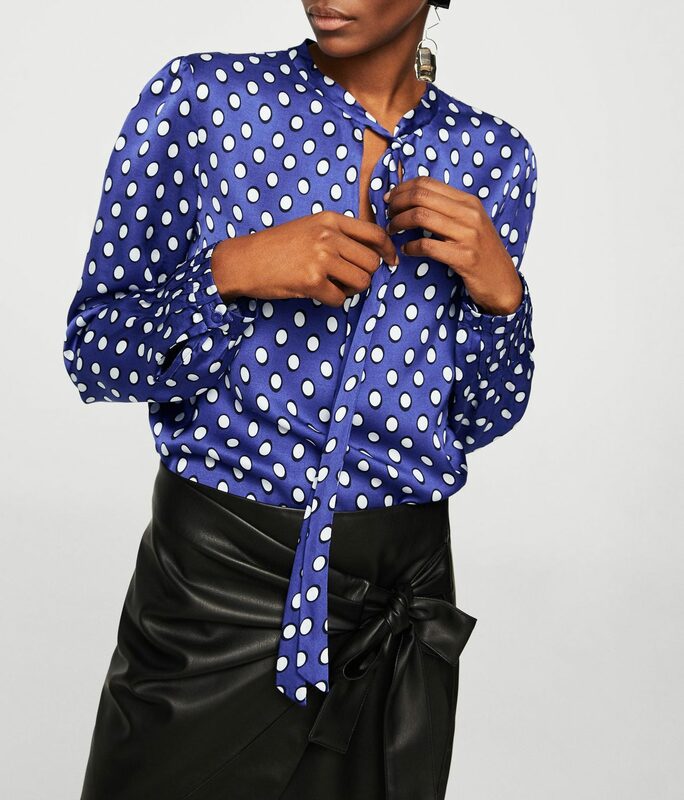 I’d wear this blouse under a blazer, or on its own once it gets warmer. I think it’s just gorgeous. 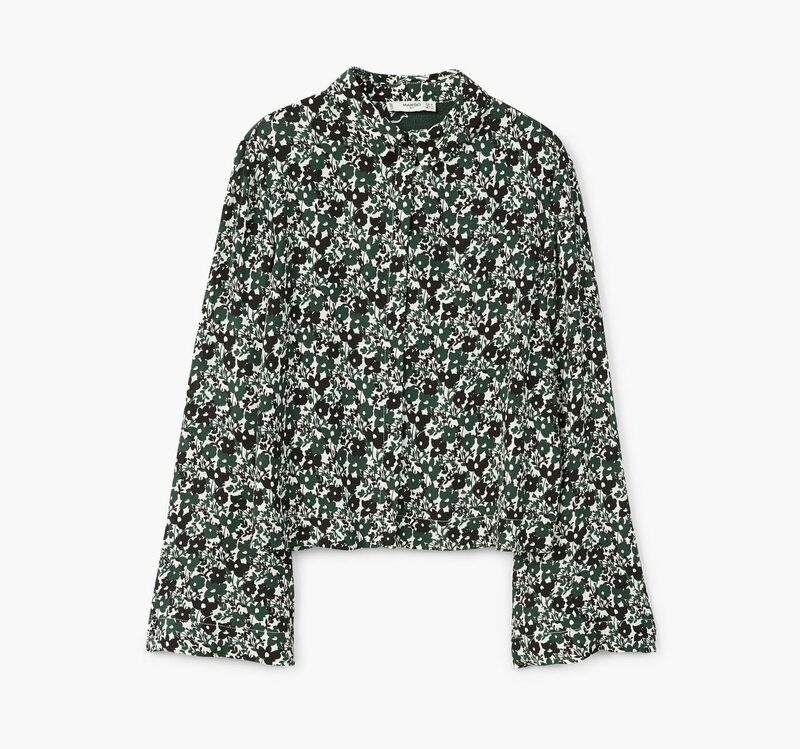 Green and black is a rare—and pretty compelling—color combo, and I think the floral here is really sweet. 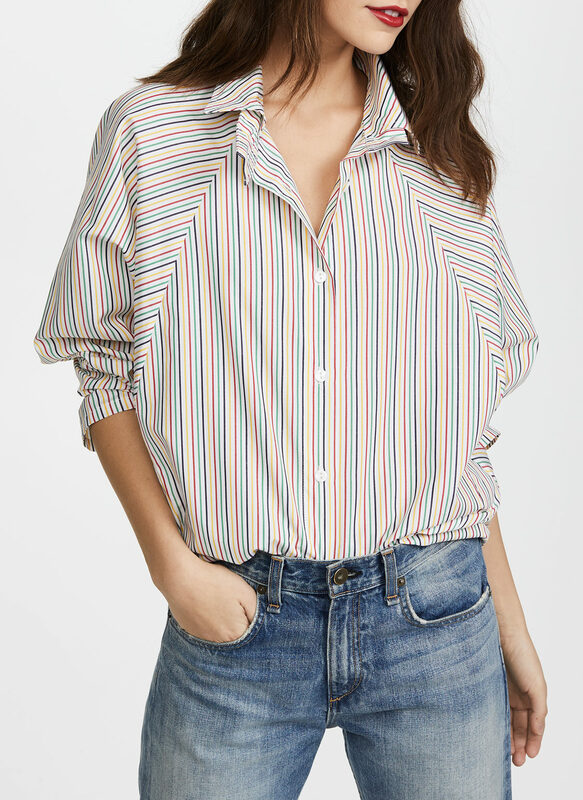 The stripes on stripes on this crisp cotton shirt intrigue me. And the rainbow stripes here are just a delight. The knot front here is excellent camouflage for a poochy stomach, and the print is appealingly retro. 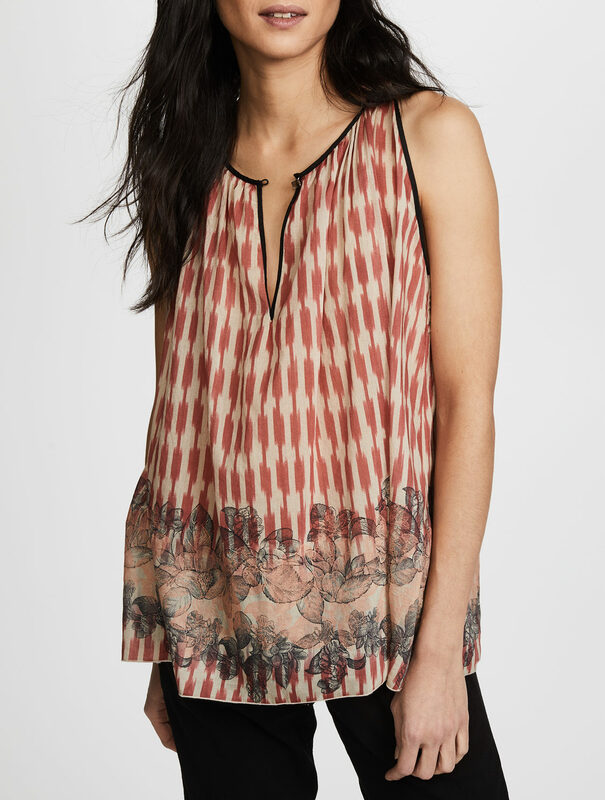 I just think the print on this somewhat splurgy Giada Forte top is so delicate and pretty. I always like an oddly-shaped dot, and the flourish at the arms here is unexpected and appealing. This blouse has a somewhat trippy print, but I really like it. Maybe the chicest heart pattern I’ve ever seen. This elephant print is just good fun. Here is a post I did recently on cute tops that cost under $100. The cloudy-looking popover made me swoon. I clicked through THREE HUNDRED AND FORTY FIVE DOLLARS. For a BLOUSE?! Okay, it’s silk, that’s nice. It’s made in China. That… honestly it just kind of made me sad for the world. The cloudy-looking popover made me swoon. I clicked through THREE HUNDRED AND FORTY FIVE DOLLARS. For a BLOUSE?! Okay, it's silk, that's nice. It's made in China. That... honestly it just kind of made me sad for the world. I try to always include pieces with a wide range of prices here, Kristie. I’m sorry you fell in love with one of the pricier ones. 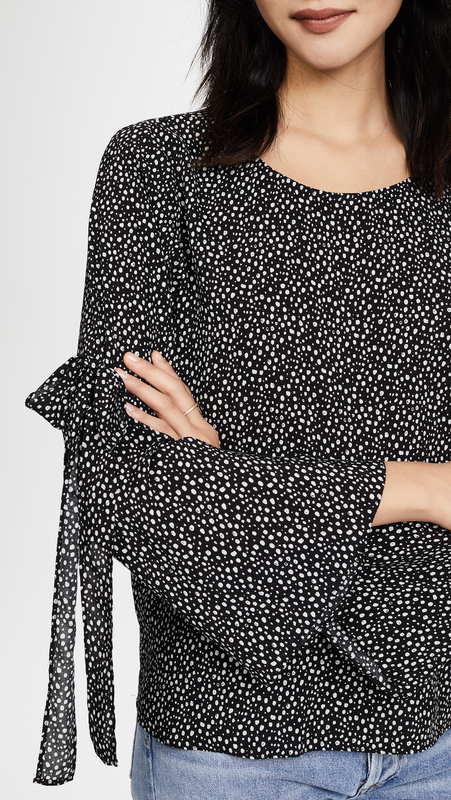 But when people pay this much for a blouse, they’re doing it because—as you mentioned—it’s swoon-worthy. 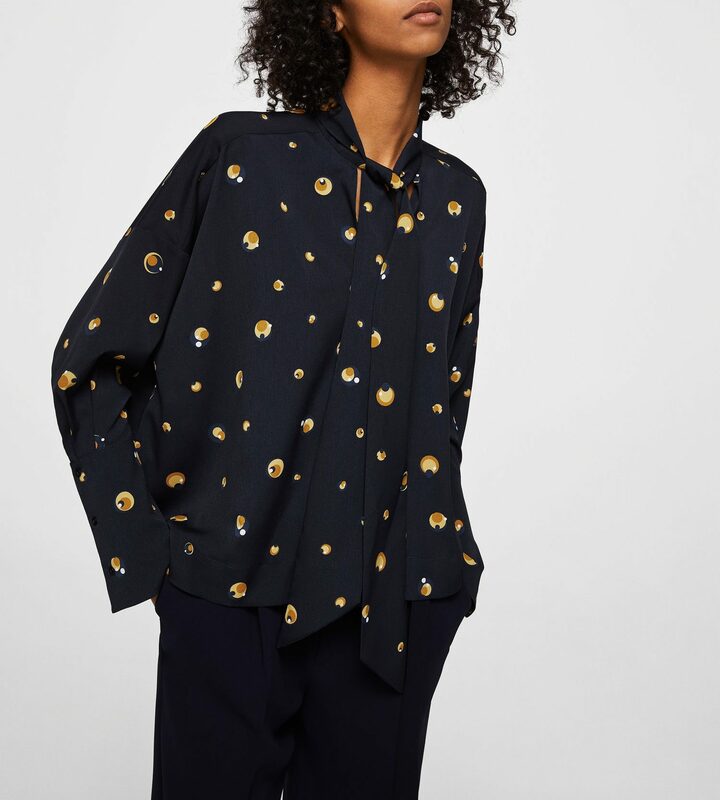 Every once in a while Mango or Topshop will have an item so good it stops me in my tracks. And sometimes I pay more, because a piece is really special. I do think that top (from Vince, who as a rule charge more than I think they should, just fyi) is special. I try to always include pieces with a wide range of prices here, Kristie. I'm sorry you fell in love with one of the pricier ones. 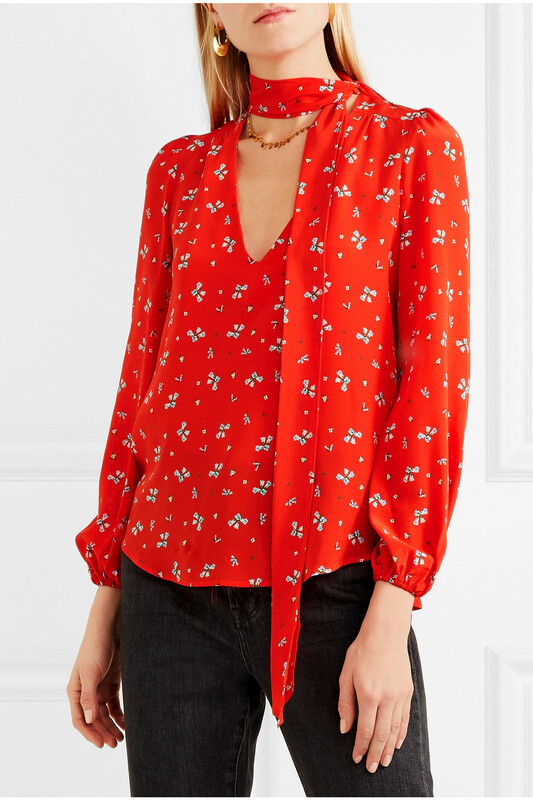 But when people pay this much for a blouse, they're doing it because—as you mentioned—it's swoon-worthy. 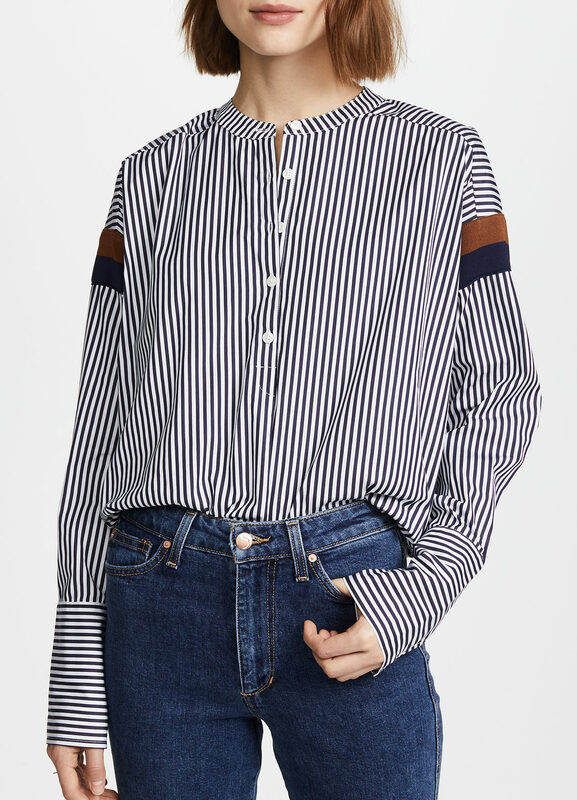 Every once in a while Mango or Topshop will have an item so good it stops me in my tracks. And sometimes I pay more, because a piece is really special. I do think that top (from Vince, who as a rule charge more than I think they should, just fyi) is special. I understand that, and did not intend to imply criticism of your work; I apologize for being unclear about that. I am a yearslong daily reader; I see the different ways you strive to be responsible in your work, and I appreciate your thoughtfulness. It’s kind of you to take a moment to respond! To clarify: if Vince were using better labor practices than most, I’d be all for their high prices. I worked for a lot of years with an artist/designer friend who made handbags that I sold in her store when I was young; I understand labor costs intimately. The burn for me is in the gap between the cost of this garment and the near-certain quality of compensation for those who make it. That Vince’s prices are so high if there isn’t an unusually good labor situation going on; ugh. That’s about Vince, not your blog! I’d be delighted to learn I was incorrect about this and that they have fine labor practices I am unaware of, but I think you’d know and have said so if this were the case. Thanks again for your thoughtful reply! I understand that, and did not intend to imply criticism of your work; I apologize for being unclear about that. I am a yearslong daily reader; I see the different ways you strive to be responsible in your work, and I appreciate your thoughtfulness. It's kind of you to take a moment to respond! To clarify: if Vince were using better labor practices than most, I'd be all for their high prices. I worked for a lot of years with an artist/designer friend who made handbags that I sold in her store when I was young; I understand labor costs intimately. The burn for me is in the gap between the cost of this garment and the near-certain quality of compensation for those who make it. That Vince's prices are so high if there isn't an unusually good labor situation going on; ugh. That's about Vince, not your blog! I'd be delighted to learn I was incorrect about this and that they have fine labor practices I am unaware of, but I think you'd know and have said so if this were the case. Thanks again for your thoughtful reply! And thank *you* for this very thoughtful reply to the reply! Polite dialog is the best. Thanks for such a kind and thoughtful reply, Kristie. I agree with both of you! I *try* to give money to people who behave well … but sometimes it’s too hard to know who they are, or I am just desperate and I have to get something. One *must* cover one’s bits! I tried not too long ago to see if I could find a group that monitors this, but I didn’t have enough time to get to the bottom of it. I think there are this and that consortia out there … but I didn’t get to a place of clarity about it. And I’ve read in the news that a lot of retailers/brands move their operations around so often, it is hard to monitor. A very good question, Viajera. It SHOULD be easier to find out the sources of manufacturers of our clothing. We seem to know that about cars and a whole lot of other stuff. Why not clothing? I know Everlane has attempted to do this, but my understanding is that it’s not a seamless process and the much-hyped “transparency” leaves something to be desired. Yes, I can imagine it could be pretty complicated if the clothes are made far away, what with time difference, language, yadda yadda. And I wouldn’t want to be too gotcha about it anyway. I am really just looking for consistent, good faith efforts. In an ideal world, people wouldn’t be afraid about what might be revealed, if they trusted that observers and consumers would be fair. I guess we aren’t there yet. I typed into Google “where can I purchase responsibly made clothing” and a bunch of sites popped up. Here are two. Don’t know if this helps. For me, if I spend more on an article of clothing I tend to wear it more often because I don’t want to “waste” my money. I am working on only purchasing “swoon worthy” clothing (I love that phrase!) because I want to enjoy everything single thing I put on my body. 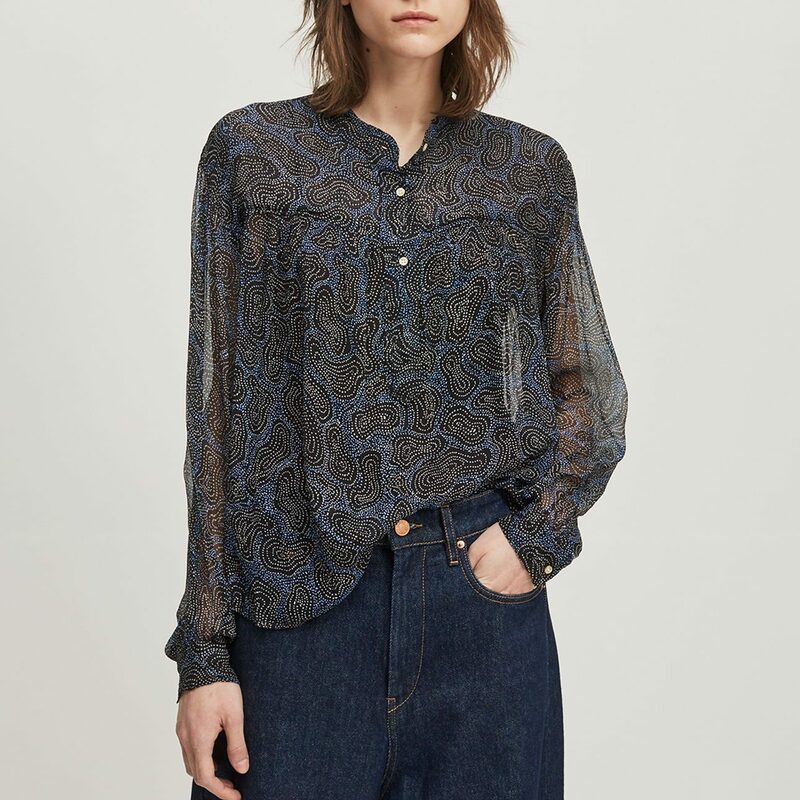 I also think the Vince blouse is swoon worthy and the Isabel Marant. Both are so, so good. Thanks, cw! 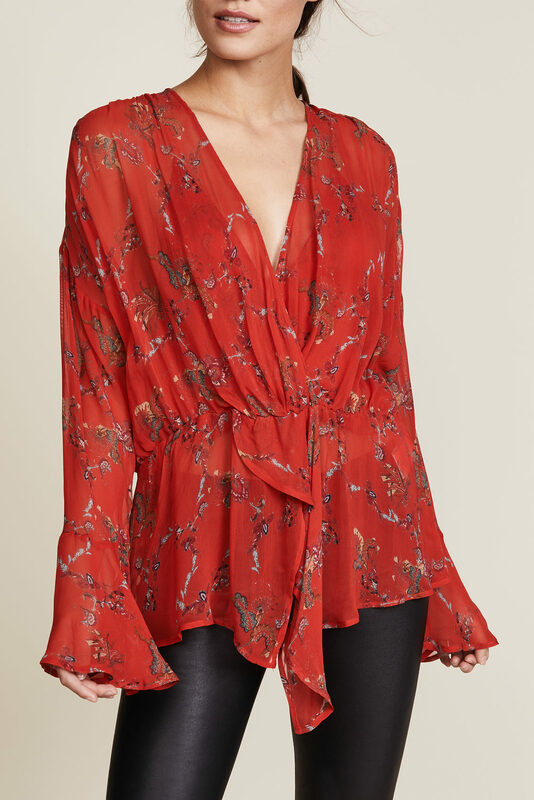 I’m a big fan of the Vince blouse, too. As well as a whole lot of the rest! Gorgeous choices, Kim! I’ve been telling myself that it’s time to put my sewing skills back to work. I need to source some great fabric and get a few patterns for pieces I know I could make more cheaply to achieve a similar look. It used to be fun! Thanks, cw! I’m a big fan of the Vince blouse, too. As well as a whole lot of the rest! Gorgeous choices, Kim! I’ve been telling myself that it’s time to put my sewing skills back to work. I need to source some great fabric and get a few patterns for pieces I know I could make more cheaply to achieve a similar look. It used to be fun! I recently invested in a sewing machine for that exact reason! I was stunned at how inexpensive they have become and equally stunned at how inexpensive good quality fabric is on line. Plus, all Kim’s suggestions are a never ending source of inspiration. Thankfully, now I will be sewing for fun and not because I need clothes…. there are some benefits to being older. I recently invested in a sewing machine for that exact reason! I was stunned at how inexpensive they have become and equally stunned at how inexpensive good quality fabric is on line. Plus, all Kim’s suggestions are a never ending source of inspiration. Thankfully, now I will be sewing for fun and not because I need clothes.... there are some benefits to being older.